The Board affirmed a refusal to register the mark shown below, for "retail furniture stores," absent a disclaimer of "FURNITURE WAREHOUSE." 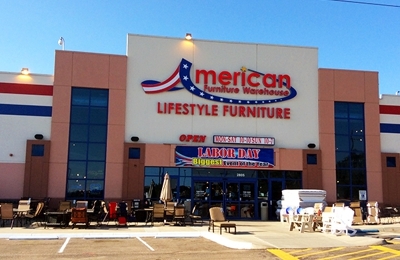 It also upheld the USPTO's determination that "AMERICAN FURNITURE WAREHOUSE" is primarily geographically descriptive under Section 2(e)(2) but ruled that the phrase has acquired distinctiveness by reason of applicant's registration for the standard character mark AMERICAN FURNITURE WAREHOUSE for the same services. In re American Furniture Warehouse CO, 126 USPQ2d 1400 (TTAB 2018) [precedential] (Opinion by Judge Cynthia C. Lynch). Geographical descriptiveness: The Board first considered whether AMERICAN FURNITURE WAREHOUSE is primarily geographically descriptive, applying its standard Section 2(e)(2) requirements: (1) that the primary significance of the term in the mark sought to be registered is the name of a place generally known to the public; and (2) that the public would make an association between the services and the place named in the mark by believing that the services originate in that place. The second prong, the services-place association, may be presumed when the services do in fact emanate from the place named. Of course, the presence of a generic term does not detract from the geographical descriptiveness of the mark. Not surprisingly, the Board found that AMERICAN is a geographic term for a place generally known to American consumers, namely, the United States. Applicant's stores are located in the United States, and furthermore consumers would believe that applicant's services originate in America. As to FURNITURE WAREHOUSE, dictionary definitions and third-party registrations and website pages, along with applicant's own description of its services as "a shop with a large stock of furniture at wholesale prices" and its website showing furniture displayed in a warehouse setting, convinced the Board that the phrase is "the common descriptive name of a class of goods or services." In re Cordua Rests., 118 USPQ2d 1632, 1634 (Fed. Cir. 2016). Unitary Mark? : Applicant maintained that disclaimer should not be required because the applied-for mark is "unitary," but it provided no explanation for its position, other than its prior registrations for two highly similar marks - but both of them included claims of acquired distinctiveness-in-part, which "signal that these marks are not unitary in nature." In other words, if a mark is unitary, a partial Section 2(f) claim is not needed to avoid a disclaimer. Acquired Distinctiveness: The USPTO did not maintain that AMERICAN FURNITURE WAREHOUSE is incapable of indicating source, but only that the phrase is primarily geographically descriptive. However, the examining attorney erroneously maintained that "the alleged genericness of FURNITURE WAREHOUSE means that it cannot be a part of the claim of acquired distinctiveness." Not so, said the Board: "the generic term may be included in the claim of acquired distinctiveness as long as an accompanying disclaimer of the generic term is provided." The examining attorney made no challenge to the sufficiency of applicant's claim of acquired distinctiveness - which was based on its ownership of registrations for AMERICAN FURNITURE WAREHOUSE in standard character form, and for a design + word mark identical to the mark at issue but without the phrase LIFESTYLE FURNITURE. For example, the examining attorney did not claim that AMERICAN FURNITURE WAREHOUSE is so highly descriptive that a higher standard of proof of acquired distinctiveness should apply. While we recognize that “consistency is highly desirable,” In re Omega SA, 494 F.3d 1362, 83 USPQ2d 1541, 1544 (Fed. Cir. 2007), consistency in examination is not itself a substantive rule of trademark law, and a desire for consistency with the decisions of prior examining attorneys must yield to proper determinations under the Trademark Act and rules. See In re Cordua Rests., 118 USPQ2d at 1635. The Board must assess each mark on its own facts and record. In re Nett Designs Inc., 236 F.3d 1339, 57 USPQ2d 1564, 1566 (Fed. Cir. 2001). TTABlog comment: Note that applicant, on appeal, did not contest the requirement that FURNITURE be disclaimed in the phrase LIFESTYLE FURNITURE. Is the word AMERICAN geographically descriptive, or is it too nebulous? See discussion of "AMERICAN" here. If "a desire for consistency with the decisions of prior examining attorneys must yield to proper determinations under the Trademark Act and rules," why is ownership of a standard character mark evidence of acquired distinctiveness? Cf. Churrascos. I think I have a difficulty with the refusal based on "geographical significance". The term "American" applies to an extremely large territory. It can also refer to North, Central and South America. Would the term "Earth" be "geographically descriptive"? There seem to be a huge number of registrations that include the term "American" in which the term was not considered "geographically descriptive".